Scientists have long known that herbivores affect the plant diversity around them. The thought was that in highly productive ecosystems—like jungles and tropical savannas—animals would favor dominant, fast-growing plants. This would free up nutrients and space, allowing for a greater variety of plants to thrive in the ecosystem overall. In contrast, herbivores in regions with low plant biomass—such as tundras and deserts—would eat whatever they could find, driving down plant diversity in the nutrient-strapped ecosystems. Now, a team of scientists including UC Santa Barbara's Deron Burkepile has tested this hypothesis by conducting a meta-analysis of studies that investigated the effects of herbivory on the plant diversity in different kinds of grasslands around the world. Burkepile, an associate professor of ecology, helped lead the 82-person team of biologists as they reviewed 252 different studies comparing plant diversity in areas where herbivores were and were not excluded. Their findings appear in the journal Nature Ecology and Evolution. When the dust settled, the correlation between herbivory and diversity wasn't nearly as clear as everyone had expected. "The data was kind of like a shotgun blast," Burkepile said. "So we wanted to tease apart why you'd see this highly variable relationship around this fairly well-accepted idea in ecology." Although the connection was small between the productivity of the ecosystem and the effects of herbivory on plant diversity, the team noticed another, much stronger association. When the ecosystem hosted a particularly vigorous species of plant, herbivory seemed to be crucial in maintaining biodiversity. For instance, grasslands in the tallgrass prairie in the American Midwest tend to be dominated by fast-growing grasses, such as big bluestem, that give that area its iconic name. The team discovered that herbivores had an outsized effect on maintaining biodiversity by keeping big bluestem from taking over and outcompeting dozens of smaller, slower growing plant species. However not all herbivores are on an equal foot, or hoof. 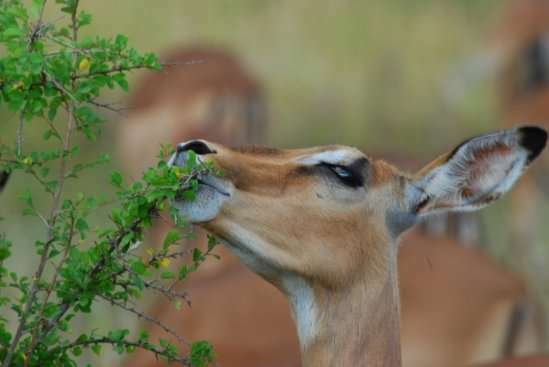 The team found that the connection between herbivory and diversity was particularly strong in grasslands where more animals graze on grass than on herbs and shrubs. This seems reasonable, since grasses tend to be the dominant species in grasslands, as the name suggests. What's more, Burkepile previously discovered that invasive animals tend to promote the spread of invasive plants, and vice versa for native animals and plants. Native plants are particularly vulnerable to invasive herbivores because they never evolved defenses against these foreigners. Not only do invasive animals reduce the abundance of native plants, they also open land and resources for invasive plants to spread. For example, cattle introduced into American grasslands often suppress native grasses and facilitate the spread of unpalatable invasive species, like cheatgrass, Burkepile said. Scientists call this an invasional meltdown, and the team hopes to suss out more details about this phenomenon in future work. These findings are more than academic. "We've seen three decades of really important papers saying that ecosystems work better when you have more species in them," Burkepile said. "What our data suggests is that herbivores are especially important for maintaining this biodiversity in places where you have a plant species that is potentially really dominant." As biodiversity continues to decline worldwide, conservationists are looking for ways to prevent catastrophic losses. "This suggests that one potential method to managing ecosystems and biodiversity is to use herbivores to manage these dominant species," Burkepile said.